This iPad mini stand is great for retail stores to show product, or for hospitality industries to utilise as a POS station. These tablet displays are designed to hold Apple® iPad Mini & Mini2, and the display makes it easy to rotate between landscape and portrait orientation for different uses. The tablet holder can easily be removed from the stand as well for potential buyer inspection and customer use. The iPad mini stand, like holders for iPads, are a secure display that are ideal for use in public areas where theft needs to be considered. A Kensington lock is included that attaches to the tablet holder and a countertop securely. The 1.7m long cable stays attached even if removed from base holder. This base is also useful for angling the tablet whilst on a table, ensuring easy viewing by all users. Click here to see our online catalogue full of hundreds of different products that may be utilised to outfit your business to be set apart from the competition. Slimline Warehouse adds new products weekly to stay current with the latest trends & styles! Orders made by 2pm EST will despatch same day to anywhere in Australia, including Perth, Adelaide, Melbourne, Canberra, Brisbane, Gold Coast, Sydney, & Darwin! 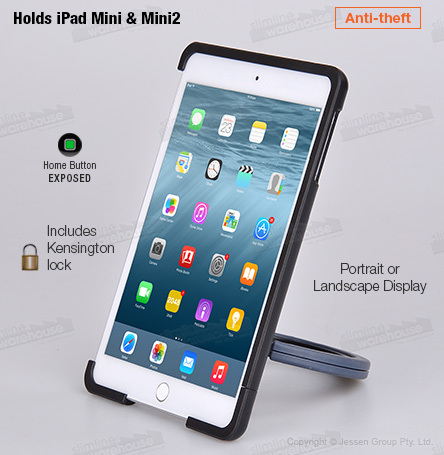 Please Note: This product has been designed to fit Apple iPad® Mini & Mini2. Although other makes & models of tablets may fit into this unit, there is no guarantee of an accurate fit.